Filippo Lauri trained first with his father, Balthasar Lauwers, a Flemish landscape painter who changed his name to Lauri on moving to Italy, and then with his brother Francesco. 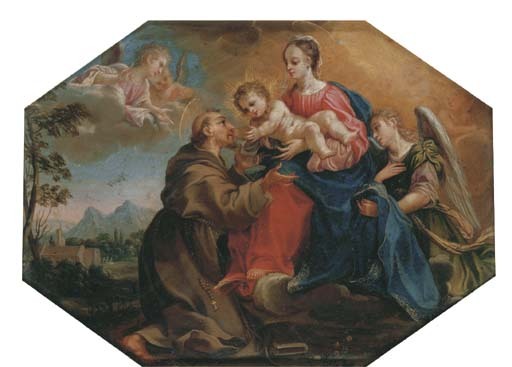 The latter had been a pupil of Andrea Sacchi, and through him Filippo absorbed the Bolognese Classical tradition of Domenichino and Francesco Albani. In 1654 Filippo became a member of the Accademia di S Luca in Rome, later becoming Principe in 1684-5. He had great success during his lifetime and worked on major commissions in Rome, including the decoration of the Gallery of Alexander VII in the Palazzo del Quirinale, under the direction of Pietro da Cortona 1656-7, decorations for the gallery of the Casino Farnese in 1662, and work in the Palazzo Borghese in 1671, as well as numerous altarpieces. He also produced small mythological and religious scenes, such as the present example, and these cabinet pictures were extremely popular with collectors around Europe. Please note this lot should not be starred in the catalogue.